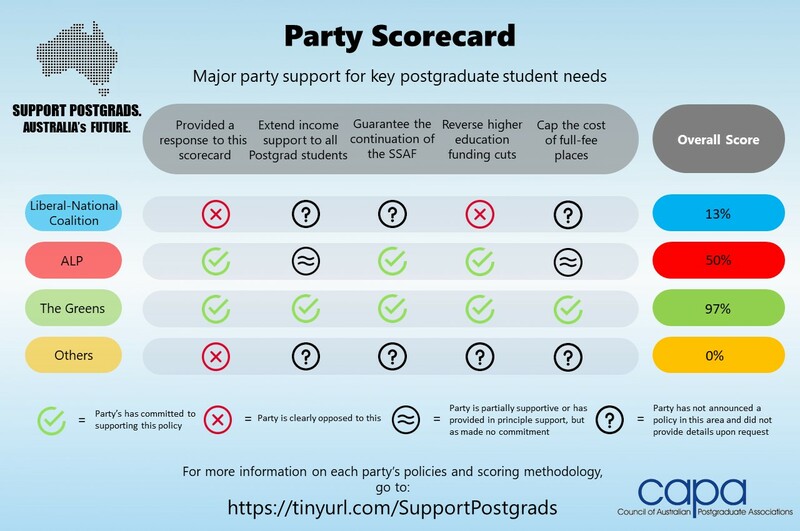 The Council of Australian Postgraduate Associations (CAPA) today launches the campaign “Support Postgrads – Australia’s Future” which assesses political parties on their commitment to the policy reforms most needed to improve conditions for postgraduate students. We found that the Australian Greens were the strongest supporter of our policy priorities, including through committing to income support for postgraduate students and supporting a cap on full-fee tuition for postgraduate coursework students. Meanwhile, Labor has stated in-principle support for many issues impacting postgraduate students, and has committed to conducting a full review of the higher education system should they form government. The Labor party has confirmed that this review will consider extending income support for postgraduate students in financial need. CAPA is disappointed that the Liberal-National Coalition could not be bothered to respond to our election questionnaire. However this may be reflective of publicly stated policy positions that are opposed to the key priorities of postgraduate students. We implore voters to take the parties’ higher education policies into consideration when going to the polls on May 18. The Council of Australian Postgraduate Associations (CAPA) says that the women in STEM initiatives announced by the Federal Government are a cold comfort as science has been starved of funding in recent years. While $3.4 million has been announced for science gender equity programs, $328 million has been ripped from research funding over the past year and a half. In other words, only 1% of the cut to research funding has been returned via the women in STEM initiatives. CAPA supports the increased investment to lift women’s participation in the STEM workforce, however this is irrelevant if research is not properly funded. There is no point creating the digital awareness initiative for women in science, when graduates of science degrees face poor career prospects in Australia due to the government’s sustained war on science. We reiterate our call for national investment to be equal to 3% of GDP. We echo statements from Australian Mathematical Sciences Institute (AMSI) and Science & Technology Australia (STA) that improvements to gender equity in science can only be achieved with investment in STEM research. “We need stable research funding and support for this program to be effective. Increased funding for women in STEM awareness is counterproductive if there is no workforce for women to end up in,” says CAPA Women’s Officer, Romana-Rea Begicevic.